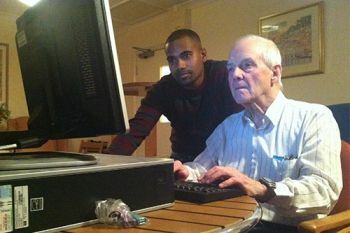 School of Informatics undergraduates assist Alleyn House residents to solve computer problems. When Leo Chapman recently experienced problems with his personal computer and could no longer call on the services of his regular technician, he felt students from nearby City University London's School of Informatics could help. Jermaine Carthy, a BSc Business Computing Systems student assisted Chapman in resolving his issues. Under the direction of City's Professional Liaison Unit (PLU), Carthy is also on a placement with the University's Information Services department as a customer support assistant. The PLU offers a variety of work-based learning programmes tailored to meet the varying requirements of employers and students in the School of Informatics and the School of Engineering and Mathematical Sciences, through the provision of placements, internships and work-based learning. "Things go wrong with computers. As our part-time, hourly-paid computer technician had left, I thought City's School of Informatics might be able to assist. A notice was sent out and I received about 40 replies. Such a response led me to think that there are around five thousand flats within walking distance of City and that it would be a great outreach project for the University and its students on computer courses to help residents experiencing all-too-frequent computer glitches and make some money for themselves. Already two Alleyn House residents have been helped. In future, training in ways to make one's computer more useful could also be provided." "Working with local residents is a wonderful opportunity. I am able to use the skills I am developing from my placement and put these skills to good use. I also get to strengthen my own skills while feeling enjoyment and satisfaction out of helping others. This opportunity fits into my work schedule as the hours are flexible." "We aim to enrich the student experience by equipping our students with the tools required to bridge the gap between education and employment. Supporting local residents with technical queries and IT training is a rewarding way to achieve this. Our local community is important to us and our students benefit from developing technical and transferable skills through this work. Our aim now is to work on creating a mechanism where more residents can be supported." For more information on the PLU, click here.